Vs. System 2PCG Extended Art cards are coming! Back in the day of original Vs. System, one of the most popular items that players wanted were “Extended Art” (EA) promo cards. They were pretty cool because you got to see more of the artwork, which was originally hidden behind the card frames. Even to this day they’re still pretty collectible. We’re happy to officially announce that we’re bringing back Extended Art cards for Vs. System 2PCG. We’ve also updated how we’re going about extending the art. One of the downsides to the original EA cards was that in order to reveal more of the image, the text and text frame had to be made smaller. For cards with a lot of text, it could sometimes be difficult to read. We have updated the EA cards and settled on a pretty sweet design that will not only allow more image to be seen (covering more of the card than the original EA’s did, actually), but at the same time not have to scrunch the text. Also, we did find a way to put one small “retro” item on the card that should be useful to players and collectors. If you remember original Vs. System, since it was a booster pack model, cards had different rarities. The rarities were indicated by a different colored card number on the bottom of the card. Light Blue was uncommon and Gold was rare. You’ll notice that the regular card number from the set is still in white, but there’s an additional card number next to it with a VSP designation, which is colored. VSP stands for Vs. Promo, and the color will signify roughly how many of those promos will end up in circulation. So, for example, if you attend an event that awards an EA card as top finisher prizes, but also awards a different EA card as a participation promo to everyone in the event, the participation promo EA would likely have a light blue card number while the prize card would likely have a gold card number. Also, the separate “VSP” card numbering will make it much easier for players who are trying to attain a full collection of all the EAs to figure out if they’re missing any. 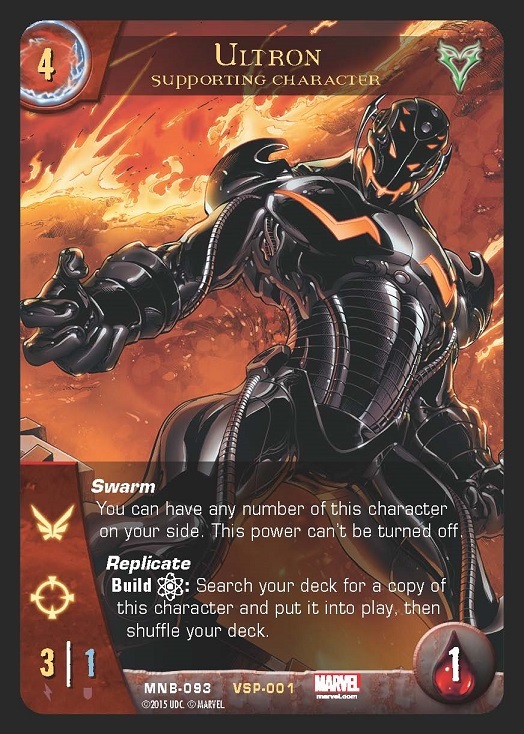 So, without further ado, we bring you the first Vs. System 2PCG Extended Art card: Ultron. We’ll have more on where you might be able to get Ultron coming soon, but he should (fingers crossed) be making his grand entrance in the next month or so! 1) why aren’t these promo’s being sent to OP stores? 2) when are you making more? 3) are there plans for a new expansion? 4) when are more premier event going to get started? Your window is closing to get this Organized Play stuff setup and keep people interested. We are here. We are interested. Don’t let us down!